For Prairie Trace Elementary art teacher Catherine Carnahan, the Art for the Sky project is a perfect fit. Art for the Sky creator Daniel Dancer brings his project to schools, communities and companies, creating large living paintings made up from people. 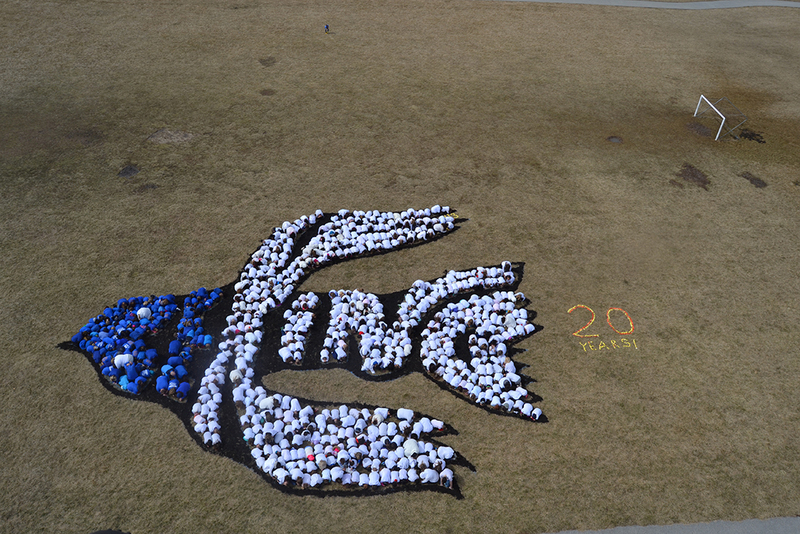 In this case, all Prairie Trace students, teachers and staff played a role in forming the picture of a hawk, the school mascot, March 12. The picture also spells out Be Kind. The picture kicked off the school’s Kindness Week. Carnahan said Dancer talked to the students about the view of the ground from the sky. “Sometimes, we don’t see the small picture of how we are taking care of our earth until we look from the sky to see the impact we have on the earth,” Carnahan said. The concept resonated with fifth-grader Adelina Larranaga. “It’s showing we have to protect the earth and not put more harmful chemicals in stuff,” Larranaga said. Fourth-grader Andrew Nix said he likes that the project raises awareness for the environment. Fourth-grader Lila Komp said art is one of her favorite subjects. “It’s really fun because we all just get to work together and put everything together to make the picture,” Komp said. Prairie Trace Principal Jill Schipp was especially pleased with the Be Kind message.